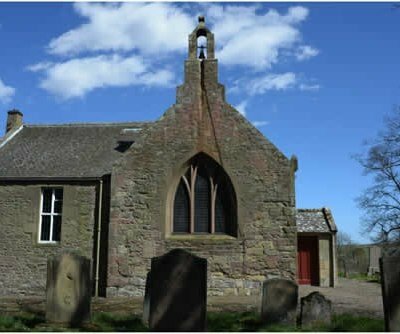 Christianity in Berwickshire goes back 1400 years and the first written record of a kirk on this site is from 1098. 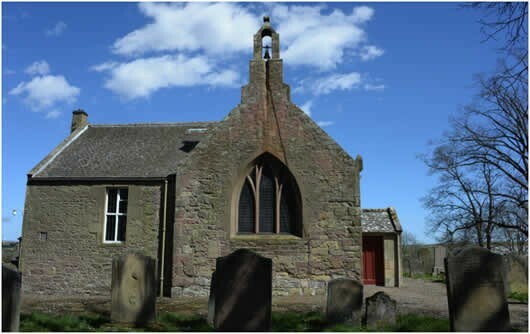 The original stone building was built around a wooden Celtic church and the kirk has undergone many changes in its long life. Over a thousand years ago it was a long, narrow east - west building with the altar at the east end. It was renovated in 1593 and extended in 1782, and again in 1837. In 1910 under the direction of Sir Robert Lorimer the roof was raised and new pews and pulpit were installed. The ‘Flodden Bell’ (one of the oldest in Scotland) was rung in 1513 to sound the death of so many of Scotland’s finest men at the Battle of Flodden. It has the words “Mary is my name, 1499” (in Latin) inscribed around it. Swinton Kirk was originally a narrow wooden building (founded over 1300 years ago) but has been greatly altered over the years. The south and east walls are over 1,000 years old and the Aumbry from those Pre-Reformation days can still be seen. It is now an L-shaped building because of two extensions in previous centuries. The last renovation (1910) was by Robert Lorimer, which included having a banked set of pews to allow an easier view for the worshippers. The kirk is a Grade B Listed Building. The bell in its very simple belfry, is from the troubled days of Border warfare and skirmishes. Although the bell is actually called "Mary" it is affectionately known as the "Flodden Bell" as it was rung in 1513 to sound the death at the battle of Flodden not only of King James IV but also of so many of Scotland's finest men and of a whole nation's hopes. It was also possibly rung before the battle to muster some troops. The bell is still rung before kirk services. Around the bell are the words :- "Maria est nomem meum, 1499" ("Mary is my name, 1499"). The bell is one of the oldest in Scotland, and is believed to be the oldest still in constant use. There are many links with the Swinton family, including a family tree stretching back to the 9th Century. Behind the communion table is an effigy of Alan Swinton (who died about 1200). This is believed to be the oldest effigy in Scotland, whilst what is also thought to be the oldest stone coat-of-arms in Britain (of the Swinton family) is above the gallery door. On the east wall of the kirk is a stone form 1635 to commemorate the marriage of Sir Alexander Swinton and Margaret Home, whilst their gravestone is outside on the north-east wall. The windows are made of squares of ancient coloured glass, apart from the west window which commemorates the re-purchase of the Swinton estate by members of the Swinton family. It has the view of the Cheviots from Swinton in the midst of the Biblical picture of the Promised Land. The sundial on the west porch is in memory of Oswald and Mary Brewis of Little Swinton. The central pillar inside the kirk is supposed to be a copy of the pillar in the middle of the Village Green. In 1497 Norham Castle was besieged by an army led by James IV of Scotland. One of the guns used in the siege was a 22 inch (56 cm) calibre cannon called Mons Meg, which is now located at Edinburgh Castle. On the way to Norham one of the carts carrying the cannonballs over-turned in the Leet (the river which runs behind Swinton Kirk). Cannonballs from Mons Meg were found when they were clearing out the Leet about a hundred years ago. All but two were taken back to Edinburgh Castle . One was presented to the local land-owner and another to the minister of Swinton Kirk. There are no facilities but there are toilets available across the driveway between the kirk and the manse. Please park safely in the lay-by opposite the church. If travelling on the B6461 from Berwick the kirk is the first building on the right as you enter the village. If travelling from Duns or Coldstream the kirk is at the east end of Swinton village, just after the B6461/A 6112 junction. It isnot the building in the middle of the village (this is the village hall).